This Thursday at 7:25 pm (CT) the New England Patriots will travel to Tampa Bay to take on the Buccaneers. The Patriots are coming off a huge surprise loss (30 to 33) to the Carolina Panthers, who had looked to be on the edge of complete collapse with an injured Greg Olsen and Kelvin Benjamin, and a struggling Cam Newton. The Patriots look to rebound, but will be facing a tough Jameis Winston led offense. The Buccaneers look to build on their 2-0 home record after beating the New York Giants 25 to 23 in Week 4. Both defenses have struggled so far this season, so this Thursday night could see a lot of points. 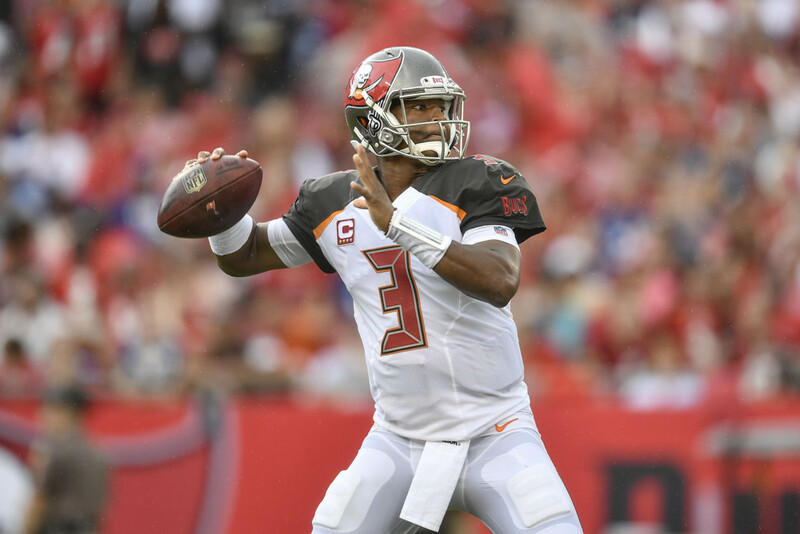 Jameis Winston torched the Giants’ defense in Week 4 for 332 yards and 3 touchdowns. Winston has been known to have great fantasy days against tough matchups, and disappointing fantasy days in easy matchups, so Week 5 is a tossup. The Patriots have given up the most points to opposing QBs, so Winston should have easy pickings. This might point to a bad day for Jameis fantasy-wise, but with Tom Brady being able to put up a lot of points, Jameis will have to throw a lot to keep up. Jameis should be started as a QB1. Doug Martin owners rejoice! His suspension has ended and he should see the field for the first time this year. That being said, he has not had much practice and as of now we don’t know how he will be used in the first week back. Jacquizz Rodgers has struggled as a fill in for Martin, but did put together a good Week 4 against the Giants, rushing 16 times for 83 yards and adding 2 receptions for 25 yards. The Patriots rank 31st in points allowed to opposing RBs, so this is a good matchup for whoever starts. As of now, Rodgers will probably still see some carries as they ease Martin back in. If Martin is given the starting duties, he is a RB1 in this great matchup. If it looks like they will split carries, Martin is more of a RB2/Flex option. Jacquizz probably should be avoided unless Martin, for some reason, sits. Mike Evans should feast this week on a terrible Patriots’ defense. He caught 5 passes for 67 yards and 1 touchdown last week, and is an obvious must start in this one. Fantasy owners seemed to have forgotten about Adam Humphries, who was a target monster at times last season. In the last two weeks, Humphries has been targeted 17 times. Last week, he turned 7 targets into 6 receptions for 70 yards. The Patriots like to take away the best player, so Winston may have to look away from Evans and target his other receivers. This, as well as the shootout potential, bodes well for Humphries, and he is a decent Flex option. Cameron Brate caught 4 passes for 80 yards and 1 touchdown in Week 4, and should see plenty of targets against the 32nd ranked defense in points allowed to TEs. With a shootout looming, Brate has TE1 streaming appeal in this game. Tom Brady was solid once again in Week 4, throwing 45 times and completing 32 of them for 307 yards and 2 touchdowns. The Buccaneers haven’t been great against opposing quarterbacks, and plus, it’s Tom Brady. He is again a top 5 QB. The Buccaneers have been ok against the run, which makes it a tough choice on what to do with the Patriot running backs of Mike Gillislee, James White, and Dion Lewis. Gillislee led the Patriots last week again with 12 carries for 49 yards. James White had 1 carry for 7 yards but had a great PPR day by catching 10 passes for 47 yards. Dion Lewis had 4 carries for 18 yards and 1 touchdown and added 1 catch for 9 yards. Gillislee still looks to be the lead back has touchdown potential if they get near the goal line and is probably more of a RB3/Flex play. White is a risky Flex PPR play, and seems to fluctuate in targets (5, 8, 1, 12 in Weeks 1-4 respectively). Lewis should still be avoided in all leagues. Rob Gronkowski had a “down” week last week, catching 4 of 5 targets for 80 yards. The Buccaneers rank 4th in points given up to tight ends, but even in a difficult matchup Gronkowski is a must start. Brandin Cooks followed his 131 yard and 2 touchdown performance against the Texans in Week 3 with a 3 catch, 38 yard day against the Panthers in Week 4. This just proves how difficult starting Patriots can be. Brady likes to spread the ball around, but is facing the current worse defense against WRs. If this game is indeed a shootout, Cooks should see more targets. He is looking like a fringe WR1/WR2 in this matchup. Chris Hogan saw 9 targets in Week 4, grabbing 5 of them for 60 yards and 1 touchdown. As mentioned above, the Buccaneers are currently the worse defense against WRs. Hogan should see a good amount of targets once again and looks to be a high end WR3 in this game.